Did you know that The Social Network has more VFX shots than Godzilla? David Fincher certainly knows that. Well known for his meticulous and detail-oriented filmmaking methods, the director even has an editing technique named after him. Today I’m going to teach you that technique. A master of visual effects, it’s no surprise why Fincher is one of the most beloved filmmakers working in Hollywood today. His noteworthy directorial portfolio includes Se7en, Fight Club, The Social Network, and a handful of other popular titles. In the past decade he’s also been experimenting in the wonderful world of episodic streaming content on Netflix with House of Cards and Mindhunter. Prior to his entrance into the world of feature filmmaking and his love affair with Netflix, Fincher worked on high-end commercials and music videos for the likes of Madonna, Michael Jackson, and The Rolling Stones, just to name a few. If we go back even farther we can find Mr. Fincher at Industrial Light & Magic where he worked on Star Wars: Return of the Jedi, The Neverending Story, and Indiana Jones and the Temple of Doom. Aside from his impressive resume, what makes David Fincher stand out from all of the other filmmakers working today? What is he known for? The director has a distinct reputation for being a perfectionist. Many actors who’ve worked with him have discussed the large number of takes he likes to do throughout production. Mark Ruffalo was sure he was going to be fired after take #85 of a walk-and-talk scene in Zodiac. The opening dialogue of 2010’s Social Network between Jesse Eisenberg and Rooney Mara reportedly had 99 takes. So what’s the deal? Why so many? The technique is also known as split-screening, split comping, and of course, my favorite, the David Fincher Effect. Fincher and his editor Kirk Baxter have worked together since 2008. Baxter was nominated for an Academy Award that year for his work on The Curious Case of Benjamin Button. He began to use the split comping technique two years later while editing The Social Network. This job actually won him an Oscar (along with co-editor Angus Wall). The following year he and Wall once again heavily used split comping while working on Fincher’s Girl with the Dragon Tattoo, and astonishingly brought home their second Oscar. Since then, he hasn’t looked back, going on to use the technique in Gone Girl, House of Cards, and Mindhunter. Now don’t get confused. The name of the technique pretty much explains itself perfectly. When applying this method in the editing room, you’re essentially splitting the screen in some way and compositing two different takes or elements together to give the illusion of one seamless shot. Mindhunter Assistant Editor Billy Peake does a good job of explaining the technique. I understand that even with all of the explanation, it might still be a bit difficult to actually visualize what a split screen comp looks like. To best show you what’s going on let’s take a look at the individual elements that make up one of these split comps. A good way to do this is to just go ahead and create a new one. Below I have a clip from the Netflix series Mindhunter, and I’m going to take you through the steps of how to create a split screen comp which we can use to subtly retime and adjust a character’s reaction. Let’s get started. First of all, don’t worry too much about your editing software, as all you really need to make the effect work is a way to mask or crop a layer. 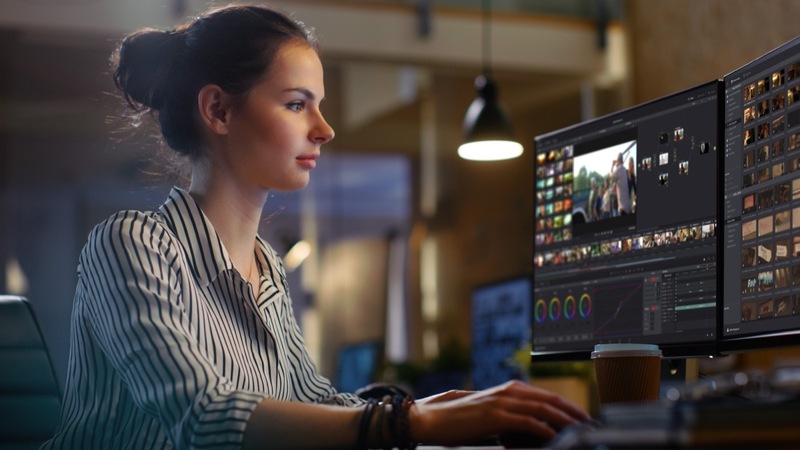 These tools are available in nearly every nonlinear editing program, including Final Cut Pro X, Davinci Resolve, Premiere Pro and After Effects. For this example I’ll be working in Adobe Premiere Pro. To create my composite, I need at least two clips. Since I’m working with only one shot, I’ll duplicate the layer and then place the duplicate directly on top of the original. Next, I need to isolate the part of my shot that I want to adjust. For this particular clip, it’s my main character. He’s on the far right-hand side of the screen, perfectly separated from the foreground and background subjects. The fact that none of the elements are overlapping between the foreground, middle ground and background will make isolating the subject quite easy. To isolate my main character I’ll grab the Opacity Pen tool in the Effect Controls panel and draw a new Mask around my subject. To make the composite work, I’m applying the mask to my top layer. The lower layer will serve as my clean plate. To see how the mask looks I can turn off the visibility of the bottom layer. To make sure the shots blend well, I’ll add some feathering to the edges of my mask. Then I’ll position my Mask points and adjust the feather until my composite is as seamless as possible. For the final step, I can simply adjust the timing of the isolated subject clip on the top layer. Notice as I move the clip around, the original shot stays in place. With the subject now isolated from the rest of the scene, I have ultimate freedom when adjusting this reaction shot. If I want, I can invert the mask and adjust the background and foreground of the comp instead of just the subject. Check out what happens as I move the isolated clip around with the Mask inverted. Once I’ve retimed and adjusted the edit to my liking, I can make any additional adjustments to help make the mask seamless. Again, this shot is quite easy to work with since none of the action between foreground and background is overlapping. If I did have some significant overlap with certain elements, masking might take a bit more work. Check out the shot below to see the final adjustment. Again, this is a composite consisting of two elements—the isolated subject, and the original shot. It’s a very simple effect, and can be accomplished very quickly. Once it’s composited, I can make adjustments to the isolated clip at any time to further manipulate the reaction shot of my character by shortening it or just adjusting it to better match the dialogue. If you decide to go out and attempt to create your own split screen comp, you’ll quickly learn a few things. First, you need a very stable shot (ideally with a tripod). Any movement and your composite can quickly fall apart, or you’ll need to perform some serious tracking and additional VFX. Also, as I mentioned earlier, it can be difficult to create a split comp when the subject you’re trying to isolate is overlapping with something else in the frame that’s moving. For instance, if you have another actor walk through the foreground or background, it can quickly destroy the composite by interfering with the mask. Even these situations can usually be repaired with careful work, but it takes deeper compositing knowledge and often a lot of time in paint and roto. If you want to make things easy for yourself in post-production, plan ahead before you go out and shoot. Avoid unnecessary tracking and rotoscoping work by using a tripod and giving attention to elements in the frame that could affect the composite. This includes extras, cars, and even lighting changes. As with most things, practicing the technique will make you better. So what’s the deal with all of these Academy Awards for editing? While the tutorial above is a good example of how to create a split screen comp, I only scratched the surface in regards to what you can actually achieve when applying this technique. Yes, you can use split comping to take control of the timing of scenes, opening up precise control over your dialogue. You can make things more cinematic by extending a reaction shot, or by drawing out a dramatic gaze between two characters. Or do the opposite and increase the intensity of a scene by closing various gaps in speech. You can change the entire feel of your film by simply tweaking the pacing via speeding up or slowing down dialogue between characters. And sure, you can mix and match the best performances of a number of different actors between a multitude of takes. You can use split screen comping to match the continuity between shots, or even get rid of a boom operator (genius!). I’ve even seen examples of editors isolating parts of an actor’s body, using an arm from a take that is different from the rest of the body, all to avoid a fidget. Byron is exactly right. The main focus of his job as an editor on the Mindhunter series is to create drama via the dialogue. By controlling the dialogue, he gains control over the drama. And when you control the drama, you control the story. It’s no surprise at all why David Fincher incorporates this technique in nearly all of his films. It gives him an insane amount of control over the editing process, and therefore over his film. And as we all know, Fincher is a borderline control freak. A meticulous, detail-oriented director that knows exactly what he wants. This is why the David Fincher Effect is a perfect name for the split screen comping technique. As I mentioned earlier, many facets of Fincher’s filmmaking process are quite unique, which in turn make his productions stand out from the rest. Both the cinematography and color grade will quickly give away the fact that you’re watching a Fincher film or TV series. However, one thing that you’ll never notice is the split screen comp that’s probably right in front of you in nearly every two shot. Like any good visual effect, it’s hidden in plain sight. For it to be effective, it has be unknown to viewers. Just like all good editing.